Another day, another soup it seems. I just love the warm comfort of a bowl of soup. Broccoli Cheese Soup is one of my husbands favorites (besides Campells Creamy Parmesan Tomato Bisque, much to my chagrin.) I can't make Campbells from scratch, since I don't use the preservatives that are in a canned soup. Although, to his credit he did say he'd try my tomato soup again, if I could just make it smoother and less chunky. But I digress... I made this soup for him because he wasn't feeling well yesterday and with the drizzly rain outside of course it was just calling to be a soup day! 2 head of broccoli, chopped into small bits. The stem works well in this recipe too! In your favorite soup pot, brown the bacon. When bacon is almost crispy add onions. Saute until onions are translucent. Add butter and melt. Add seasonings: salt, pepper, tumeric, thyme & hot pepper flakes. Sprinkle flour across bacon, onions & butter; stirring quickly to wet it with the butter. Stir the flour for a few minutes to let it cook for a bit. Pour in heavy cream and chicken stock and bring to a boil. Melt in grated cheese. Add broccoli and let simmer until broccoli is tender. I guess I've switched from soups to pizza today, since this is my second pizza recipe in a row. I found this Almond Flour Crust Pizza a few days ago and knew I wanted to try it. It passed the test! Everyone in the family ate it up. Be warned though, the pizzas may be small, but they are filling. I got the recipe from ComyBelly and it's a good one. I made my own Almond Flour by first making "Crispy Almonds." You make crispy nuts by soaking your nut of choice in water and salt for 24 hours to break down the phytic acid, which isn't good for you. Then either on the lowest setting of your oven, or a dehydrator, dry the nuts out for 12 hours until crispy and tasty. They actually taste much better this way! To make almond flour, just process a few almonds at a time in a food processor and sift the "flour" away from the bigger pieces. Don't over process or you will make a nut butter. Mix almond flour, parmesan, salt, oregano, garlic powder and basil in a medium size bowl. In a small bowl beat two eggs with olive oil. Mix the wet and dry ingredients together. Using a 3 tbsp scoop , place six scoops of the dough on either a sil-pat or parchment paper that is on a large cookie sheet. Put a bit of olive oil on your finger tips and flatten dough out into a circle. It won't spread when you cook it so you only need to leave a small space between each crust. Bake at 350 for 10-13 minutes. Top with your favorite pizza toppings and bake until cheese is bubbly. I was reading my favorite cooking/nutrition blogs a few days ago, and came across this idea for a recipe. I wish I could give credit, because these are REALLY good. I did add caramelized onions and tomato sauce to the recipe, but the idea to use the squash this way wasn't mine. Anyway, this is a must try recipe, it is really terrific! Pre-heat oven to 375. Peel butternut squash and cut into 1/2" disks, be careful to make them the same thickness so they cook evenly. Rub each disk with olive oil, salt and pepper. Bake on a cookie sheet for 20-25 minutes until you can easily pierce with a fork. Meanwhile, brown sausage in a skillet. Slice onion into very thin slices and saute them in a little olive oil (or bacon grease) while the sausage is a different skillet. Cook the onions on medium heat for 20-30 minutes. Remove butternut squash from the oven and switch the oven to broil. Assemble the pizzas by placing a bit of sausage on each disk, top it with a bit of onion and then the feta cheese. Place under the broiler for 4-5 minutes until feta starts to brown. Serve on top of some tomato sauce. It'd be great with some fresh basil on top, but I'm not sure if butternut squash and basil are ever in the same season? Anyway, this was a huge hit for our family and I think I'll hide the leftovers! With the dip in temperature (finally!) stew seemed just the thing for today's menu. While I was at Sprouts, my local health food store, I picked up some pork and beef stew meat this morning. I threw this stew together in perhaps 15-20 minutes this morning and let it simmer all day long on the stove. The house smelled great! Mix flour, some salt and curry in a shallow dish. Dredge meat in flour and shake off excess. In a large stock pot, melt coconut oil. Place meat in and brown for a few minutes, turning as needed. Remove meat to a bowl. Add, chopped carrots, celery and potatoes to the stock pot. Let cook for a few minutes, stirring the vegetables to bring up the brown bits from the bottom of the pot. Add garlic and deglaze the pot with red wine. Add meat back in, and broth. Add coconut milk and stir. Simmer on low for as long as possible, at least 3 hours until meat is fall apart tender. I baked cupcakes tonight! I don't bake, I cook and cooks don't follow recipes. At least this cook doesn't, even when I really, really, really try. I made sure I had all the ingredients, times two. I made the decision to do the recipe twice so I wouldn't mess up trying to double it (that is a major mistake I commit time and time again.) But yes, somehow I still messed up. This time though, it resulted in very rich, moist super delicious chocolate cupcakes. And since I misused my chocolate chips and didn't have any for the icing, I went with a plain white icing which actually was okay, because these things are so decadent that chocolate icing would have been overkill. To see the original recipe please visit Pink Parsley. I know that my twin girls are going to love them for their three year old birthday party tomorrow! For the ganache filling, place chocolate and cream in a small microwave-safe bowl. Cook on high power until mixture is warm to the touch, 20-30 seconds. Whisk until smooth, and transfer to the refrigerator. Let stand until just chilled, no longer than 30 minutes. For the cupcakes, Preheat the oven to 350 and line a muffin pan with cupcake liners. Place chocolate and heavy cream in a microwave bowl, melt on high for about 45 seconds. Whisk until smooth, and transfer to the refrigerator to cool completely, 20-30 minutes. Divide batter evenly among muffin pan cups, filling each 3/4 full. Place one slightly rounded teaspoon of the ganache filling on top of each cupcake. Bake until cupcakes are set and firm to the touch, 17-19 minutes. Allow to cool in pans 10 minutes, then transfer to a wire rack to cool completely before frosting. For the frosting, combine the sugar, egg whites, and salt in the bowl of a stand mixer. Set over a small saucepan of simmering water, and whisking constantly, cook until the mixture is slightly thickened, foamy, and registers 150 degrees on an instant read thermometer, 2-4 minutes. Fit bowl to stand mixer, and with the whisk attachment, beat at medium speed, until mixture is the consistency of shaving cream and slightly cooled, 1-3 minutes. Add butter 1 piece at a time, until smooth and creamy. The frosting may look curdled halfway through, but it will smooth out eventually. Once all the butter as been added, pour in the vanilla. Mix until well combined. Increase speed to medium-high and until light and fluffy, another 30 seconds to a minute. Welcome to any new readers! 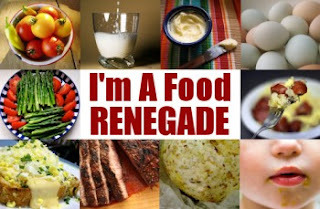 This is my first time to participate in a Food Renegade Fight Back Friday post. The Frickin Chicken is a blog I started almost two years ago, mostly for myself as a place to keep recipes. At that time I was on Weight Watchers and I was eating what I thought were "healthy" foods. The leaner the meat, the lower the fat the better, or so I thought back then. Over the past year, I've been following the Real Food Movement and I've jumped on board! I'm excited to learn all the new things I can about where food comes from and nutrition. The post I'd like to share with you for Fight Back Friday is actually and article I wrote for the Dallas Morning News Moms Blog about my Journey to Real Food. I'd love everyone to read it and if you like it, please leave a comment (either here or there) and "recommend" the page. You can find the link here: http://momsblog.dallasnews.com/archives/2010/12/my-journey-to-real-food.html. I saw these sugar plums on Nourished Kitchen's blog a couple of days ago and knew I had to try them for my girls. They are basically dried fruit and nuts, both foods my girls love, how could they be bad? It was fun to read about the history of Sugar Plums on her blog too, so go check it out! She said you could roll them in powdered sugar, but they were so incredibly sweet from the dried fruit that didn't need any extra sugar! I used Crispy Nuts* instead of her freshly soaked nuts so I needed to add in a bit of water. I think a splash of rum would be a great grown-up version! *Crispy Nuts- a recipe by Sally Fallon. Soaking your nuts in salt water gets rid of the phytic acid in the nuts, an anti-nutrient that is very hard to digest and isn't good for your body. Use about 1 tsp of salt per cup of nuts. Cover the nuts with filtered water and stir in salt. Let them soak for 24 hours. Drain, and spread out on a cookie sheet and bake at 150 (or as low as your oven goes) for 12 hours. Or use a dehydrator until they are completely dry and crispy. Soak nuts over night with salt. Or if you are using crispy nuts like I did, use 1/8-1/4 cup of water to help moisten the mixture. Then toss all the ingredients in a food processor and pulse to mix. Then process for a couple of minutes until a paste forms. Using a 1 tbsp scooper, scoop out and form little balls using your hands. These are actually very sweet! I'll be the first to admit that this soup needs a bit of help in the appearance department. The color didn't come out that pretty and I accidentally let my eggs curdle in it, which didn't help the situation. Otherwise the soup tasted awesome. Seriously awesome. I ended up using 1/4 cup of whole wheat flour to thicken the soup, I need to find a better way to thicken. Either more cauliflower to add more bulk or perhaps more egg yolks. I, personally do not like plain "cream of" soups, I like to have "chunks" in my soup, so I added some sauted mushrooms, bacon and diced chicken to give the soup bite. 1 package of frozen cauliflower, you can use fresh too. Make sure the frozen package lists only cauliflower as an ingredient. Peel garlic and set aside. This took me about 15 minutes to do. Cut the bacon stips into pieces and saute in a soup pot until crispy. Using a slotted spoon, remove bacon and put it in a small bowl leaving all of the bacon grease in the pot. Add chopped mushrooms. Saute until cooked through. I had to add 2 tbsp of coconut oil (or butter/ghee/olive oil) when the mushrooms got dry and started to stick. Add mushrooms to the bowl of bacon. Place all the garlic, chopped onion and celery in the pot. Add enough oil to about halfway cover the garlic. Simmer on low heat for at least 30 minutes stirring frequently. You cannot rush this step. This is the pan roasting of the garlic. If you go to high of heat, the garlic will burn. You almost can't go too slow. When the garlic starts to turn a golden brown it is okay to continue, but the longer and slower you cook the more sweet and developed the flavor will be. Add the thyme, salt, pepper and chili flakes. Add chicken stock, water and cauliflower to the pot and bring to a boil. When cauliflower has softened use a stick blender to puree the soup. If you don't have a stick blender you can use a regular blender being careful of the heat. In a medium bowl beat egg yolks. Add a bit of the soup to temper the eggs. Keep adding a little soup at a time until eggs are as hot as the soup. Pour the egg and soup mixture back into the pot. Put 1/4 cup of wheat flour in the now empty egg bowl. Add some soup to it and whisk until there is no lumps. Add the flour mixture back into the soup. Bring to a rolling boil. Remove from heat, stir in heavy cream, chicken, mushrooms and bacon. Serve! I forgot to take a picture of this before I ate it, so this is a picture of the leftovers! This soup is so warm and cozy. The broth is drinkable, rich and delicious. What gave me the idea for this soup was a chicken pot pie. I'm eating low carb right now so I didn't want to make a real chicken pot pie, but I was wanting those flavors. As I was making the "pot pie insides" I spontaneously decided to make it a soup, by adding a lot more liquid. I'm so glad I did, this was terrific! I used a lot of seasonings, but use any combination of the ones I list according to your preferences. I was going to add fresh parsley at the end, but I forgot to add it! I'll add some in for the leftovers, parsley is full of great vitamins! In a large soup pot, melt two tablespoons of ghee or butter. Add diced carrot, onion and celery. Cook on a low heat until carrots begin to get soft. Add in garlic and mushrooms. Continue to cook on med-low until mushrooms are cooked through. Add all the spices. Add two more tablespoons of butter or ghee and stir until melted. Sprinkle flour over the vegetables and stir until the flour is wet from the butter and coats the vegetables. Add chicken stock and bring to a boil. Reduce heat to a simmer and add the heavy cream. Right before serving, add the chicken and peas, cooking long enough to defrost the peas. Enjoy! I attended a brunch playdate with some of my fellow moms of multiples yesterday and I brought this Bacon and Spinach Quiche for everyone to try. I almost forgot to snap a photo, but made everyone stop for a quick shot! 1 bag of loosely frozen spinach (I find this is better than the frozen box spinach because you don't have to thaw and squeeze all the liquid out.) Fresh spinach would work perfectly fine too! Roll crust out and place it in a pie dish. Stick it back in the refridgerator to stay cold. Cook bacon using your favorite method. I found that if you have the Pampered Chef Bar Stoneware , it cooks bacon great in the oven and you don't have to turn it. Just lay the bacon out on the stoneware and bake at 400 for 25 minutes for crispy bacon. Let bacon cool. In a large mixing bowl, whisk the eggs and heavy cream. Add salt and pepper. Grate your cheese and have it ready. Remove pie shell from refridgerator and layer bacon, spinach, cheese, and then again with another layer of bacon, spinach and cheese. If you have the loose spinach, you can place it frozen in the dish. Pour egg mixture over the layers and shake to make sure it gets evenly distributed. Bake at 375 for 40 minutes. Place butter in freezer for 15 minutes. Put flour in food processor and add salt. Pulse to mix. Remove butter and cube it into small pieces. Add to food processor and pulse 6-8 times until the butter is pea sized in the flour. Add 1 tbsp of ice cold water at a time pulse until dough starts ball up and pull away from sides of processor. Pour dough out onto a piece of plastic wrap and wrap tightly. Refrigerate 1 hour before rolling it out. About a month ago or so, I read that boxed cereal isn't very good for your body. Once I read the article (and read the same info in some other places too.) I couldn't un-read it and pretend it wasn't true. I didn't want it to be true because I LOVE cereal. I grew up on bowls and bowls of cereal. My thinking is that it isn't so bad for you that you'll keel over and die immediately, because lets face it, most of us grew up eating lots of cereal and we are still here. But it's one of those things that when you find out something isn't good for your body and actually causes harm over the long haul it is best to eliminate it or at least reduce it in your diet. John has the argument that convenience foods are just that, convenient. He says living with modern food and getting to enjoy other modern facets of life is worth some of the chemicals and such in processed foods. That is a very valid point. I believe that if you eat healthy, nutrient dense, non-chemical foods that you will have a better quality life. I've heard some people use an 80-20 rule. Eighty percent of the time eat nutrient dense foods and then 20 percent rely on convenience, restaurants or sweets. I think that is a good balance for my life. I also really enjoy cooking from scratch and learning about healthy, nutritious foods. Some people say that science has given us ways to make food cheap and easy, but science has also given us a better understanding of why some of the foods and methods our great-great-great grandparents used worked the way they did. Our grandparents learned by trial and error passing down recipes and methods over the years. We now know why mixing whey in with your cucumbers makes a tasty pickle that is full of healthy probiotics. Our great-greats just knew that it'd make their cucumbers last through the winter! Izzie and Maddie eating their homemade cereal with raisins and raw milk. Mix fresh flour and soaking medium of choice in a large, glass bowl. Cover with a clean cloth and rubber band and leave on the counter for 24 hours. 1 Tsp maple flavoring - I used almond extract because I didn't have maple flavoring. Mix these ingredients well into the soaked batter. Pour into 2 – 9X13 pans and bake at 350F for about 30 minutes until a toothpick inserted in the center comes out clean. Do not overbake.